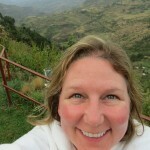 April 22, 2012, The Great Rift Valley, Ankara, Ethiopia–Woke at dawn after a great night’s sleep in the cool mountain air under heavy Ethiopian wool blankets. Had fallen asleep to the crashing sounds of a thunderstorm and pouring rain, but now it was silent. Opened the rough wooden doors held together by the local version of duct tape and stepped outside. The view literally took my breath away. The mountain ridge drops off sharply just feet from our little veranda and then views of the Great Rift Valley explode in every direction. As I tried to contemplate the beauty and expanse of the valley below and surrounding mountains, small churches on a nearby mountain top began the call to prayer, and then local birds began to chime in….a few even came to visit the veranda. As the sun began to rise, it lit up the mountains across the valley. You could hear the sounds of roosters greeting the morning sun, donkeys braying in return, and children’s voices echoing up the valley. While the Great Rift Valley stretches 6,000 km from northern Syria to central Mozambique, this is just one tiny part of it. The part of the planet where life started. A wonderful place to catch our breath before we continue our inspiring visits to the communities and children CFTC are supporting. Wish you could all be here ~ truly I do.